Successfully Added 8CH Camera Input DVR Card - Multi Screen Monitoring to your Shopping Cart. Wholesale DVR card with 8 channels real-time video input and 1 audio input through sound card with microphone. 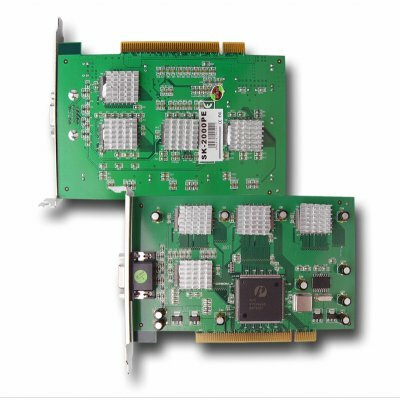 This DVR Card features high quality 640 x 480, 352 x 288 or 320x240 display and recording resolution at 200 fps in PAL and 240 fps in NTSC color systems. Image compression standard is H.264/MPEG-4 and 8~150M/H/C compression ratio with TCP/ UDP Network protocol. Compatible with motion-detecion in each channel and make 16 channels real-time monitoring come true though insert 2 cards in one computer. Very low price plus Chinavasions MOQ policy makes this an easy choice for DVR security..
Multi screen monitoring , the screen is able to be split 1,4,9,16,25 or 36 parts.